When the box office opened for Benigni's return to Florence to revive his 2006 presentation of Dante's Inferno, I reserved a subscription for 6 of the12 evenings, which concluded in a stunning climax last night.The encounter brought me face-to-face with two of my greatest idols, Benigni and Dante. 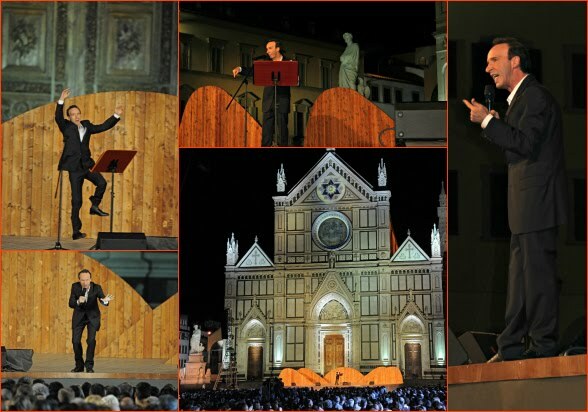 Benigni, in his genius, so eloquently and charismatically brought Dante's Inferno out of the Middle Ages, right into the lap of modern-day Florence. Just being there was a lifetime gift. I realized as I sat there on opening night that I wasn't waiting a mere few months for this night, but rather I was waiting a lifetime. ﻿﻿﻿﻿﻿﻿Following the series was akin to following some of the worlds' greatest events, like the Olympics or the Giro d'Italia. You don't want it to end, and when it does, you feel like something is missing. Last night, Benigni made his final presentation of Canto XXII, ending two weeks of profound, mind-boggling emotional entertainment. 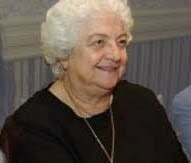 ﻿﻿During the series, I reflected upon a person who had a great impact upon me, Dr. Mirella Affron, Ph.D, under whose tutelage I first studied Dante. This exceptional woman fed my passion for Italy and awoke my appreciation for my Italian roots. Everyone has that special teacher who pinches a nerve that you didn't know you had. Who inspires and provokes you. Dr. Mirella Affron was that person for me. ﻿Last night, I looked her up on the internet to see where she is today. This is a photo of her that I found. At first, I was shocked to realize how many years have passed and how she has aged. It made me realize the long journey that I've traveled to get here. She still has that same beautiful glow in her eyes that has inspired so many students over the years. Thank you, Dr. Affron.